Who said don't play with your food? Don't listen to them. Arranging bento boxes for lunch this week has been huge amounts of fun. They take somewhere between 10 and 20 minutes to prepare, so a little longer than a normal work lunch, but they give me such pleasure at lunchtime, it's totally worth it. Even a rather drab lunch of hard boiled eggs, rice and sugar snap peas was something to be cooed over. Monday: Top left. Raspberry and chocolate soy milk ONOs with banana and raspberries, for breakfast. Two hard boiled eggs, two onigiri, cherry tomatoes, sugar snap peas, watermelon, a couple of chocolates and a prune for lunch, with soy sauce and sweet chilli in the bottles and mayo in the little yellow container. This was my first try and I was STUFFED. It's funny, because I feel like I'd usually have a bigger lunch, but it took longer to eat it, so I think I got fuller quicker. Bringing the ceremony back to the meal has made it more fulfilling. Now I have typed that, it seems obvious, but really - who knew? Tuesday: Top right. I had ONOs with mango, guava juice and a little coconut yogurt (this was a bit too sweet), and a banana. 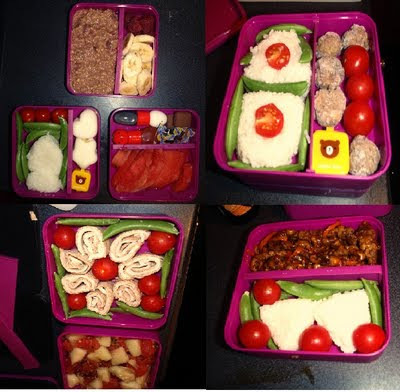 Lunch was Meatballs (as detailed in last Sunday's post), two onigiri, cherry tomatoes and sugar snap peas and wasabi in the little tub, with a bottom layer the same as Monday's. This arrangmenet drew a comment from the head of English about my rice "nests". Wednesday: Bottom left. Same breakfast. Lunch was a wholemeal chapati thinly spread with goat cheese and topped with a slice of turkey, then rolled and sliced, with veggies and chutney in a little blue tub which replaced the centre tomato. To begin with I just bunged the slices in but then felt I should try to get in the spirit of it, so they went flowery. If I'd been eating this as a wrap, I'd have made two, with double the amount of turkey. One was definitely enough. The bottom layer was a fruit salad of watermelon, melon, passion fruit and pomegranate seeds. I am quite proud of the two melons, because I bought them before I went away to Australia and they were still good to eat. Fruit from the green grocer's has a much better shelf life, I find. Thursday and Friday: Both the same, so only one picture. Breakfast oats were chocolate soy milk and sliced, tinned pears, which was a total win, and a sliced banana. Lunch was onigiri and veggies, with Mr Z's home made crispy chilli beef. Definitely not the healthiest option but oh, so good! And I made it last two lunches when I know I would have scoffed it all for one, given the option. Friday was the day I worked out I could squeeze four gummy worms into one of the little sauce tubs. The lunch table watched, captivated, as I opened the box to retrieve them, and my friend Lou said, "I want your lunch! It's so much fun!" This has definitely been a lesson in portion control and eating until full. I feel like it's made a difference this week and it's so enjoyable! I am actively looking for little sweet things that will fit into sauce cups for the end of lunch treat, and also trying to think how I can squeeze a few more veggies in there. I think I need to stop having fruit at lunch and have veggies instead. This seems to be the advice from the new Bento cook book I bought, anyway.